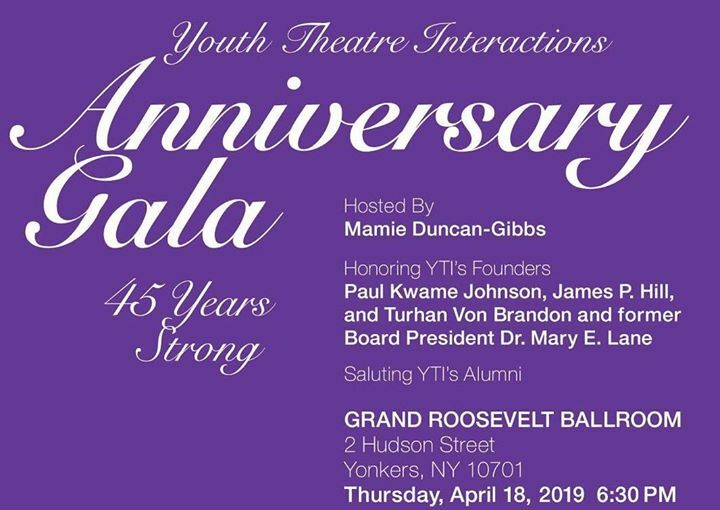 On Thursday, April 18, 2019, Youth Theatre Interactions, Inc. will celebrate its 45th year serving the youth of Westchester County. In commemorating this milestone we will be honoring our founders James P. Hill, Paul Kwame Johnson, and Turhan Von Brandon and our longest serving Board President Dr. Mary E. Lane. It was their drive and vision that made YTI the safe haven it has been for thousands of young people to create, learn, and grow. We will also pay tribute to the many that have come up through YTI. We cannot wait to see you at our 45th Anniversary Gala fundraiser.